Many of our brides can be really hesitant when it comes to booking a Convertible for their wedding day. With the crazy and unpredictable Sydney weather at the moment I can really understand why, but don’t be! All our Convertibles, our Jaguar Mark V Convertible in Black & Silver, our Rolls Royce Convertible in White and our Rolls Royce Convertible in Two Tone Silver have all been fitted with electric roofs! So in the case that it does rain or it is especially windy we can pop the roof up for you in a few seconds, it’s that easy. I can’t express enough how many beautiful shots you can achieve in a classic convertible. Firstly the shots from your home entering the car, leaving your home for the last time as a single lady and having some beautiful photos of you leaving are priceless. Then there is the arrival with your father to the Church/Ceremony, these are some of my favourites! Next up you and your new husband driving off with all your family/friends farewelling you! These are really fun and cute. We have so many of our gorgeous couples kissing as they drive away being just married. Then at your photo locations you can have some really sweet and intimate shots in the car with just the 2 of you! 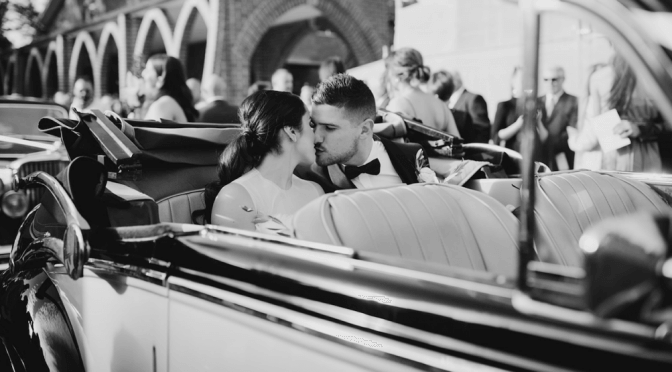 So many of these shots are missed as we can’t see you both in a Sedan driving away and it’s just a beautiful way to get the most out of your photos on the big day! Be sure to check out some of the beautiful Convertible shots on our website, instagram and Facebook!